G.D. Goenka Public School, Dwarka the premier educational institute held their first Annual Sports Day – The Goenkan Sparta in the presence of Mr. Vijay Yadav- former cricketer of the Indian National Team. Other guests who graced the occasion included Mr. Satinder Kumar- Director, G.D. Goenka World School, Gurgaon, Mrs. Sangeeta Singh, Chairperson, G. D. Goenka Public School Dwarka and Mr. Pankaj Singh, Hon. Secretary – PTA and Counsellor MCD. The day commenced with the chief guest taking the salute from the march past contingents of all the four houses: Vivekananda, Tagore, Teresa and Radhakrishnan. 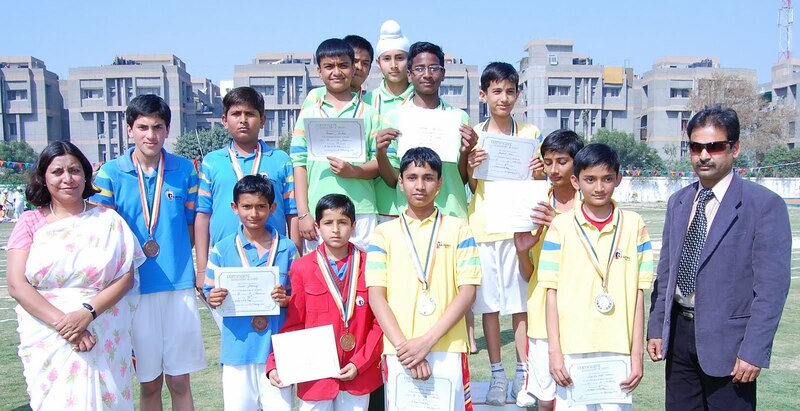 The Sports Meet consisted of a plethora of events including races , relays , long jump, high jump, Yoga display, Taekwondo, short put, discus throw, Aerobics display interspersed with Teachers’ and Parents’ races. With an amazing spirit, the trophy for the ‘Best House in Sports’ and ‘Best Overall House’ went to Vivekananda House. It was a marvellous display by the students of classes Nursery to VII. It was a spectacular event where the students and the parents were equally charged up with zeal and enthusiasm. The Parents and teachers all stood proudly as students breezed through to the victory stand to receive their medals, trophies and shields.